Any tourist to San Francisco City must be armed for changing temperatures. A sunny summer's day may just turn chilly with a heavy fog. Pack along a sweater or overcoat. Though San Francisco California has a moderate climate, the constant breezes from the Pacific Ocean can make a sudden change in the temperatures. 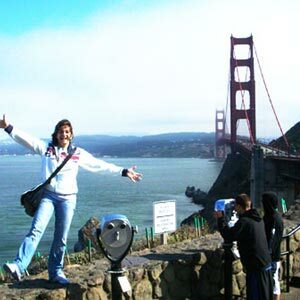 Pack along shorts, t-shirts and casual clothing if you are a summer tourist to San Francisco California. Tourist guide to San Francisco would include some of the city's famed attractions - Alcatraz Island, Golden Gate Bridge and the cable cars. Look up our city guide to San Francisco for a peek into the other attractions. Tourists visiting San Francisco during the Chinese New Year celebrations can witness the grand procession on Grant Avenue. Festivities and carnivals are celebrated with gaiety in Chinatown. The Cherry Blossom Festival is celebrated in Japantown with events such as traditional tea ceremonies and martial arts demonstrations. The Howard Street in San Francisco becomes the How Weird Street during the How Weird Street Faire - an electronic music festival that is awash with fun and entertainment. It is very popular with the youth. A tourist to San Francisco traveling with kids must not miss the San Francisco Zoo, especially the Lemur Forest, Children's Zoo and Animal Resource Center. Take the children on a tour of San Francisco on a restored Mack Fire Engine, red fire suit and all! Don't miss the street performers near Fisherman's Wharf near the waterfront shopping complexes. San Francisco California is home to probably one of the US's oldest International Film Festivals. If you are traveling to San Francisco in June, you can take in the Gay Pride Week and the outrageous Gay Freedom Day Parade that follows it. Art lovers can look up the San Francisco event guide for performances of the San Francisco symphony or the San Francisco Ballet. Don't miss the Stern Grove concert series from June to August. Catch the Shakespeare performances, Folsom St Fair and Halloween celebrations at San Francisco. A must see on any San Francisco city guide is Lombard Street - America's crookedest street. Check up any San Francisco city guide and you will find Fisherman's Wharf - one of the interesting places in the city. Choc-a-bloc with Italian seafood restaurants and vendors selling takeaway seafood cocktails, this area is popular for its waterfront views. South of Market area, you can find the Zeum - a children's art center. Drop in at the Sony Metreon complex nearby for a movie on IMAX. San Francisco has the largest Chinese community in the U.S and probably the oldest too. There is a budding Vietnamese community in the Tenderloin area. San Francisco city has some regional neighborhoods such as the French Quarter, Hispanic Mission District and Italian community in North Beach. San Francisco in California is home to a large number of gay families that are concentrated in areas such as Noe Valley, Diamond Heights, Bernal Heights, Hayes Valley and SOMA. Bayview and Hunters Point are concentrated with African Americans. The historic area at Union Street and Pacific Heights runs for nearly seven blocks and is a shopper's delight, with galleries, boutiques and stores. You can find Nordstrom, Macys, Tiffanys, Chanel and other outlets such as Warner Brothers, J. Crew and Urban Outfitters. There are fine restaurants and pubs for the night out too. The Ghirardelli Square is a historic landmark in San Francisco City that boasts of boutiques, fine culinary restaurants and special events.As any travel guide to San Francisco would inform you, traveling by car within the city can be difficult - steep roads and few parking spots. Parking is at a premium in the city and parking regulations are strictly enforced. A tourist guide can take you around the city on a walking tour. You can catch the sights and sounds of the city as you walk along its streets. If you are looking to see Napa Valley, why not take a helicopter ride or even a hot air balloon ride. Enjoy the scenic fertile valley that is home to nearly 300 wineries. You can enjoy a guided tour into some of the larger wineries?and taste some too!